Note: This article has been reproduced from the "Essays on the Bhagavadgita," with the permission of the Publishers. No part of this work shall be reproduced in any manner without the prior written permission of the publishers and the author, except brief passages as part of an academich study or research. You may consider the Bhagavadgita a reference book on Hinduism. You do not have to read many scriptures to understand the tradition, which is considered eternal and divine. You may read the Bhagavadgita a few times with concentration, and you will know the essential features of Hinduism better than most people who consider themselves Hindus. Lord Krishna was a great reformer. He incarnated upon earth to restore dharma, which was being destroyed by the excesses of selfish kings, ignorance of people and conflicting opinions of scholars of His time. Lord Krishna revived the theistic elements of our tradition at a time when atheism and agnosticism was on the rise. He integrated diverse philosophies of the ancient wisdom and presented them together for the benefit of people, which are available to us today in the form of the Bhagavadgita. You may consider the scripture a summary of the principles and practices of Hinduism, presented from a spiritual perspective for the liberation of people who are ready for it. However, this scripture is not meant for religious propaganda. It is a book of duty, devotion and liberation. It is not meant to attract people from other faiths or confuse them with unfamiliar concepts. If you read the Gita, you know why this is important. In the Gita Lord Krishna Himself explicitly prohibits teaching the scripture to those who are not qualified for it. In other words, the Bhagavadgita, unlike the Bible, is not a missionary tool. Its knowledge is not for everyone. It is especially meant for those who are devotees of God, who have love and veneration for Krishna or Vishnu or Isvara and who are free from doubt and demonic nature. To follow it sincerely and benefit from it you must become pure like a clean mirror. To understand its percepts, your mind must be open and receptive to divine truths. You must have the discerning wisdom to know the right from wrong and reality from delusion. Liberation is not for everyone. If you are not naturally drawn to the subject of liberation, you should better focus on what you are good at and keep doing it dutifully until you get tired of it. This is the message of the Bhagavadgita. Karmayoga is the first step in our inner awakening. Your journey of liberation begins when you take your duty seriously and perform it selflessly. When your actions become offerings, your life takes a new turn. Your mind opens up and you begin to receive divine guidance, first imperceptibly, then clearly, and convincingly. The antiquity of the scripture is debated by scholars. Whatever may be its true date, the philosophy contained in it is as old as the earliest of the Upanishads. We may consider it a compendium of the teachings of the Vedas and find in it traces of several schools of ancient philosophy that are now lost. While the teachings of Lord Krishna probably existed in a fragmented form in the Indian subcontinent since the later Vedic period, they might have been brought together as a scripture much later, probably after the death of the Buddha. Based on the similarities in styles, according to some historians there are valid reasons to believe that the Bhagavadgita is a “genuine part” of the Mahabharata. As a scripture in its current form, it probably existed since 400 B.C.E. Its ascendance might be in response to the growing popularity of Buddhism and Jainism, at a time when the Mathura region, the birthplace of Lord Krishna, came under the influence of foreign rulers like Sakas and the Kushanas. The Bhagavadgita is probably one of the most dissected, discussed and debated scriptures of Hinduism. It is more organized than the Upanishads and easier to read and understand in comparison. Unlike the earliest Upanishads, such as the Brihadaranyaka Upanishad, its focus is more on the subject of liberation and self-transformation rather than the cryptic ritual symbolism and its associated terminology. Divided into 18 chapters, it contains 700 verses (according to some versions 699), which deal with various subjects such as the Self, the body and the senses, the field of Nature, Supreme Self, rebirth, gunas or qualities, liberation, devotion, surrender and so on. The scripture is a purifier. Those who read its verses regularly find it very inspiring and enlightening. Some of the verses and phrases found in it make an excellent subject for contemplation and meditation, besides providing great insight into the nature of our lives and the means to liberation. If you read it every day, you are bound to feel the difference in your thinking and attitude. If you are in difficulties, you can use the book to find answers to your vexing problems. If you keep referring to it regularly, gradually you will gain peace and stability. You will not come to the Bhagavadgita and understand its percepts, unless you have done some good karma in the past and earned enough merit. As Loird Krishna said in the Gita, there is no loss in this effort. Even if you have put in some effort in the past, it will show up at the right time in your life and lead you in the right direction. It may not be appropriate to read the scripture with the expectation of some gain. However, if you begin reading it occasionally, you will gradually become aware of the importance of overcoming desires and performing actions for the sake of God rather than for yourself. Do not be fooled by the apparent meaning of the verses in the scripture or some archaic phrases whose meaning we have lost. It is just one aspect of it. People may interpret the verse in various ways, but what you understand from it is of utmost importance because it reflects your own spiritual growth and inner transformation. I may tell you that the scripture is about monism or qualified monism, but you must know it and feel it in your heart by your own convictions. The scripture offers you ample freedom to interpret its doctrine. Hence, scholars from every school of philosophy found in it enough evidence to just their own arguments. To understand it clearly, you also need to know some important concepts of Hinduism, such as karma, Self, rebirth, yoga, Nature and so on. Some of the verses are also constructed like the sutras. You have to use your imagination and fill in the blanks to complete their meaning. Some verses are difficult to understand because of the usage of certain words and phrases whose meaning we have lost. You may also find it difficult to correlate a few chapter titles with the content presented under them because sometimes they do not seem to go together. The scripture also contains some hidden symbolism. Even a seemingly inconsequential verse may contain some latent meaning, discernible only to a few. Conceived originally as a text within another text (the Mahabharata), it is presented as a conversation between Lord Krishna and Arjuna in the middle of the battlefield. While on the surface it may appear as a religious conversation, hidden within its verses you will find parallels between the main percepts of Hinduism and their symbolic representation. It is not clear whether it was intentional or coincidental, but the following striking examples of symbolism indicate that the scripture has a far deeper spiritual significance than what it presents superficially to the ordinary readers. Bhagavadgita means the song of the glorious Lord (bhagavat). It is derived from the Sanskrit word, bhaga, the equivalent of “baga” of old Persian and “bog” of Slavic languages, meaning lord or god. The modern name “Baghdad,” meaning god-given is derived from Persian root word “baga” only. Bhagavan, another derivative word refers to Godhead endowed with six supreme qualities, namely strength, fame, wealth, knowledge, beauty and detachment. Bhaga is the name of one of the twelve solar deities (Adityas) of the Vedic pantheon. He is mentioned in the Vedas as a god of wealth and marriage. Known for his brilliance, he is mentioned in the Rigveda as the god who rewards people according to their merit. Bhaga also means wealth, prosperity, lordship, virtue, pleasure, enjoyment, beauty, dignity and distinction, which are usually the qualities, associated with God or someone in a position of great power and authority such as a divine king. Bhagavad means glorious, illustratious, powerful, divine, venerable and holy. Bhagavadgita is therefore a glorious song or a holy song. According to the Vaishnava tradition, the devotees of Krishna are of two types, simple devotees (bhaktas) and servants of devotees. The latter are known as the bhāgavatas, specially chosen or appointed by God to serve His devotees selflessly. The Bhagavadgita is not only a song about duty, devotion and liberation but also about how one may learn to serve the Lord by becoming a true bhāgavata, performing selfless actions in His service and offering their fruit to Him only. The bhāgavatas exemplify the principles of the yoga of knowledge (jnana), action (karma), devotion (bhakti) and renunciation (sanyasa). They perform actions with surrender, detachment and devotion without the expectation of reward or result. They simply obey the instructions of God with humility and surrender. You may compare them to the Bodhisattvas of Buddhism, who delay their own liberation to render selfless service to the humankind out of pure compassion. We may consider the Bhagavadgita a sacred song of God for the devotees of God and the servants of the devotees of God. It is not meant for everyone, but only for those who have faith, love and devotion to God and who are willing to give up everything and surrender to Him. In the scripture itself, Lord Krishna declares that of all the people, His devotees are dearest to him; however even among His devotees, He declares that none is dearer to Him than those who teach the Gita to His devotees. Thus, the Gita offers two choices to those who pursue its knowledge, to become a devotee (bhakti) or a servant to the devotees of God (bhagavata). The dialogue between Arjuna and Krishna took place in the battlefield of Kurukshetra, which is also known popularly as a holy land (dharmakshetram). It is holy because it is saturated with the blood of several great warriors (yodhas) and eminent souls (mahatmas) who fought and died in the performance of their duties. The location chosen for the occasion was not accidental. The Bhagavadgita was purposefully delivered in the middle of a battlefield and in a sacred place. Lord Krishna, being the Supreme Self and the Knower of past and future, would have chosen any other place to deliver the message. He would have anticipated the reaction of Arjuna and given him the counseling even before arriving at the battlefield; but he purposefully chose the battlefield to denote that in the battlefield of life, we all are warriors, and that the message of the Gita is appropriate and useful for everyone who wants to become a divine warrior. Symbolically, Kurukshetra represents the field (kshetra), otherwise known as the body, the earth, Nature and world itself. These four aspects of our material existence have one thing in common: they are subject to the modification of the gunas. The body is a battlefield, in which the gunas wage a constant struggle for their predominance. It manifests in us as a conflict between good and evil intentions and between pure and impure thoughts. The divine and demonic qualities arise in us because of the gunas only. Sattva represents divinity and purity. Rajas and tamas represent egoism darkness and delusion. The same conflict happens in the outside world also. Life is a hardship because we have to deal with many obstacles in our struggle for existence. If we are looking for liberation, we have to struggle even more. If we want to lead pure and austere lives, we have to overcome all our evil tendencies. It is possible only if we deal with them with the firmness of a warrior, the wisdom of an enlightened yogi, the austerity of a karmayogi and the noble attitude of a person of renunciation. In the Bhagavadgita, Lord Krishna Himself described the body as the field (kshetra) and the Self as the Knower of the field (kshetrajna). If you are on the path of liberation, the first thing that you need to deal with is your attachment with your body and your dependence upon it for your identify and individuality. You have to support and promote good thoughts and intentions in you so that eventually you will overcome your own demons and become equal to all the modifications that arise in you. The battlefield was therefore appropriately selected for the discourse and to deliver the message that in this great war of our lives, we have to fight our own battles both individually and collectively against our painful afflictions (klesas), evil tendencies and demonic qualities, with the help of God and the practice of yoga. Krishna and Arjuna, the two principal characters of the Bhagavadgita, represent the two fundamental dualities of creation in the microcosm of a living being (jiva) and in the macrocosm of the Universal Being. In the macrocosm, Arjuna stands for the individual Self and Krishna for the Supreme Self. In the microcosm, Arjuna stands for the ego-self and Krishna for the inner Self or the eternal Self. Arjuna personifies egoism, worldliness, delusion, and ignorance, while Krishna the immortal, and indestructible Self. The conversation between the two represents the reflection of the transcendental knowledge in the purified citta (consciousness) of an individual in a state of self-absorption. It is the reflection of the Knower of the Field in field itself, whereby one overcomes delusion and becomes aware of the inner Self and the need for liberation. In a state of duality, Krishna is the subject, Arjuna is the object and the Gita is the connecting link. Historically, Krishna and Arjuna are referred to as the primeval being (nara) and the eternal Self (Narayana). They signify the relationship between man and God. Their relationship is not one-sided. It is one of mutual love and respect. When human beings love God and worship Him with devotion, God responds even more by showering His love and grace upon them. He provides them with knowledge, helps them in their liberation and gives them an exalted place in His Abode, higher than what He accords to the gods and the celestial beings in the creation. You can see a similar theme hidden in the symbolism of the chariot. Before the discourse began, we learn that both Lord Krishna and Arjuna entered the battlefield in a chariot. Krishna was driving it, while Arjuna was sitting inside it as a passenger with his bow and arrows. This imagery has obvious implications. You can compare the chariot to the human body or the field. The two wheels on which it runs represent the wheel life and the wheel of karma. The spokes in the wheels represent the diversity, divisions and the pairs of opposites inherent in our existence. Arjuna represents the embodied self (jivatma) and Lord Krishna the transcendental Self (paramatma). We may compare the horses to the sense organs and the reins to the limbs of yoga. The overall symbolism of the chariot and its occupants suggests that to win against adverse forces in the battlefield of life, you need to perform your duties, restraining your senses with the help of God, and allow Him to direct your life according to His Will. When you surrender to Him fully and unconditionally giving over to Him the reins of your life, He will take personal responsibility for you and your actions and guide you in the right direction towards liberation. The Bhagavadgita begins with a question from Dhritarashtra and an answer from Sanjaya. Those who are familiar with the Mahabharata know that Sanjaya was appointed by Dhritarashtra, at the behest of Vyasa, to act as his official commentator and give him a firsthand account of the events in the battlefield with his clairvoyance. Dhritarashtra, as a blind king, personifies egoism, ignorance and delusion. Sanjaya, with his knowledge and supernatural abilities (siddhis) personifies discriminating intelligence (buddhi) or wisdom. Both the aspects are part of the field (body) and this worldly (apara) in contrast to Krishna and Arjuna, who represent the transcendental reality (para) as the individual Self and Supreme Self. In terms of gunas, Dhritarashtra represents the qualities of tamas, Sanjaya rajas and Arjuna sattva, while Krishna embodies pure sattva (suddha sattva). Dhritarashtra lacked discrimination and thereby allowed his children to fall into evil ways and precipitate the war. From the question he posed to Sanjaya, it is clear that he was not at all interested in the dialogue between Arjuna and Krishna. He just wanted to know what was happening in the battlefield and how his sons were preparing to fight. It was by chance that he happened to listen to the discourse; but from his reaction in the last chapter, we can discern that the entire teaching of the Gita had no impact upon Him, although he listened to it. In contrast, upon the completion of the discourse, Sanjaya was completely filled with rapturous joy. In life, we get many opportunities to acquire knowledge that leads to our liberation; but if we are busy with our lives and attachments, we do not notice them. It was the same case with Dhritarashtra. The long discourse had no major influence upon the third recipient of the discourse. He was fated to ignore it or not follow it because the Kauravas were already destined to die in the hands of their cousins as per the Divine Will. Bhagavadgita is a revelation. You find in it knowledge coming straight from God Himself. However, the scripture is not traditionally considered a revelatory scripture (sruti), a status, which is enjoyed only by the Vedas. This makes one wonder whether one should take this scripture seriously at all. If it is not an important scripture, one wonders why it has been held in such high esteem by the scholars of Hinduism on par with the Upanishads and the Brahmasutras. The answer is hidden in the scripture itself in the manner in which the narrative has been built and structured around the four important characters, namely Krishna, Arjuna, Sanjaya and Dhritarashtra. Although the scripture is a dialogue between Krishna and Arjuna it was heard by Sanjaya and conveyed to Dhritarashtra. Thus, technically the scripture qualifies as a sruti text because firstly, it came directly from God and secondly, it was composed after it was heard by a few people from the mouth of God and it became part of the human wisdom. In the Bhagavadgita, the verses are attributed to four principal personalities, namely Lord Krishna, Arjuna, Sanjaya, and Dhritarashtra. Symbolically they represent the four states of consciousness, four levels of knowledge and four methods of validating truth and four methods in which knowledge is transmitted. Dhritarashtra represents the wakeful state (vaisvanara); Sanjaya represents the dream state (taijasa); Arjuna represents the deep sleep state (prajna); and Lord Krishna represents the transcendental state (turiya), which is described by the Upanishads as the state of Brahman. The four levels of knowledge are ignorance, lower knowledge, higher knowledge and transcendental knowledge. These four are represented symbolically by Dhritarashtra, Sanjaya, Arjuna and Lord Krishna respectively. Ignorance is a state of delusion in which truth is not perceived at all. It is mental and spiritual darkness, in which one fails to discern the right from wrong and truth from falsehood. Lower knowledge is the knowledge acquired by study, reason and observation. It is useful in the performance of obligatory duties and achieving success in worldly maters, but not very useful in achieving liberation. Higher knowledge is the knowledge of the Self, which arises from inner purification and the practice of yoga. You can use to practice yoga, cultivate virtue and develop discerning wisdom, but by itself, it does not give you a taste of the transcendental state. For that, you need to acquire the transcendental knowledge, which comes in a state of self-absorption, after you spend years perfecting your practice of yoga and become an adept in it. The four methods (pramanas) of ascertaining or validating truth are direct (pratyaksha), inference (anumana), comparison (upamana) and testimony. Not all traditions in Hinduism recognize these four. Some recognize only two or three. Of these, Krishna represents the direct knowing because He is the Truth itself. Arjuna represents testimony (sabda) because he witnessed and heard the discourse directly from Lord Krishna, who is the source of all scriptures and revelations. Sanjaya represents inference (anumana), because he heard it indirectly from Lord Krishna through his psychic powers. Although he was not present at the battlefield personally, he inferred from the conversation that it happened between Lord Krishna and Arjuna. Dhritarashtra represents comparison, the fourth method of knowing truth, in which validation is done by comparing the knowledge one acquires with that, which one already has. Dhritarashtra was already prejudiced against Krishna and Arjuna. Therefore, he did not pay much attention to the conversation that took place between them. Let us now turn our attention to the manner in which knowledge is transmitted to the human beings from above. Divine knowledge flows to us in four distinct ways, direct, intuitive, indirect and memorial. In some instances, God appears before certain individuals and speaks to them directly. This is the direct method. 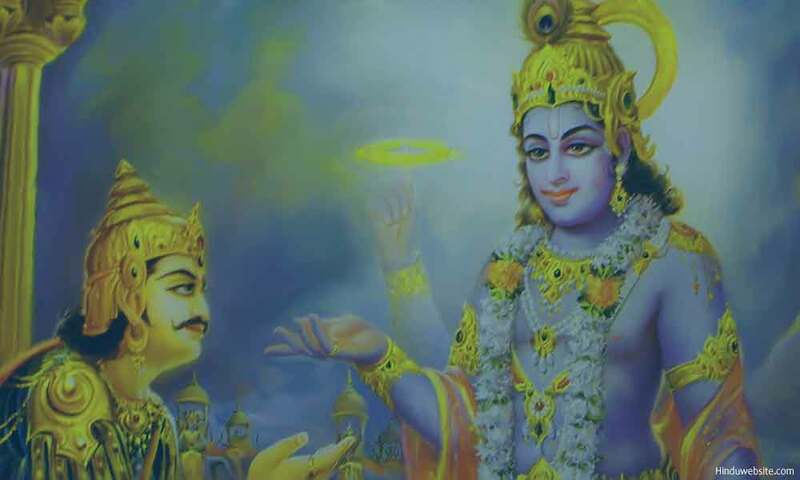 In the Bhagavadgita, Arjuna received divine knowledge from Krishna in this manner. In some cases, knowledge is transmitted through dreams and intuition. This is also a direct method, but you do not see God directly. Sanjaya received knowledge in this manner. History is replete with instances where men received divine knowledge through their psychic powers. Many spiritual truths have been rendered into religious verses in this manner. Sanjaya was like the Vedic seers who composed the Vedas by hearing them in their minds. He received the entire Gita intuitively with his mind's eye. In the third method, knowledge comes to us indirectly through scriptures, spiritual masters and enlightened people. Dhritarashtra received knowledge in this manner. The method was appropriate for him because by nature he was ignorant and deluded. His blindness symbolically stands for his spiritual blindness. Most people in the world are drawn to spiritual subjects in this manner. The teaching of the Bhagavadgita was finally composed by Vyasa based upon his ability to remember what transpired in the battlefield on that particular day between Krishna and Arjuna. This is intellectual knowledge or the memorial knowledge, which is reflected in the intelligence as knowledge and wisdom. Lord Krishna represents transcendental knowledge, which does not require any transmission because it is free from the duality of subject and object and the process of knowing. It is an eternal knowledge, which can be neither learned nor acquired, and which can be known within oneself in a state of self-absorption. In the wakeful state, this knowledge can only be inferred but cannot be ascertained through intellectual analysis or empirical proof. Lastly, we have to remember that the entire conversation took place in the middle of the battlefield, where a multitude of people, on both sides, stood with their respective weapons, ready to fight. They had no clue what happened between Lord Krishna Arjuna. They did not know why the two stood in the middle of the battlefield conversing. Their minds were seized with the thoughts of war. Their attention was focused upon winning against their enemies. They were busy preparing for the war. Symbolically, the armies of Pandavas and Kauravas represent the people in general. A vast majority of people who live upon earth do not care for their liberation. They live in their egoistic and ignorant ways incurring karma. Even if great souls come and try to put sense into their minds, they simply ignore them and continue their mundane existence. They fail to realize that human birth is a precious gift and a great opportunity to escape from the cycle of births and deaths.